with a prize of 5 digi's for the winner. The papers were free from a magazine, I coloured with Copics and added Glamour Dust, a silver fabric star, a charm, ribbon and sentiment. Do pop over to the challenge blog and take a look at the great inspiration from the team. Fab card Pat. Cute snowman and great layout. He's a really happy looking snowman Pat, so impressed with you getting so ahead with your Crimbo cards. Gorgeous card Pat. I love the cute snowman and beautiful detailing. 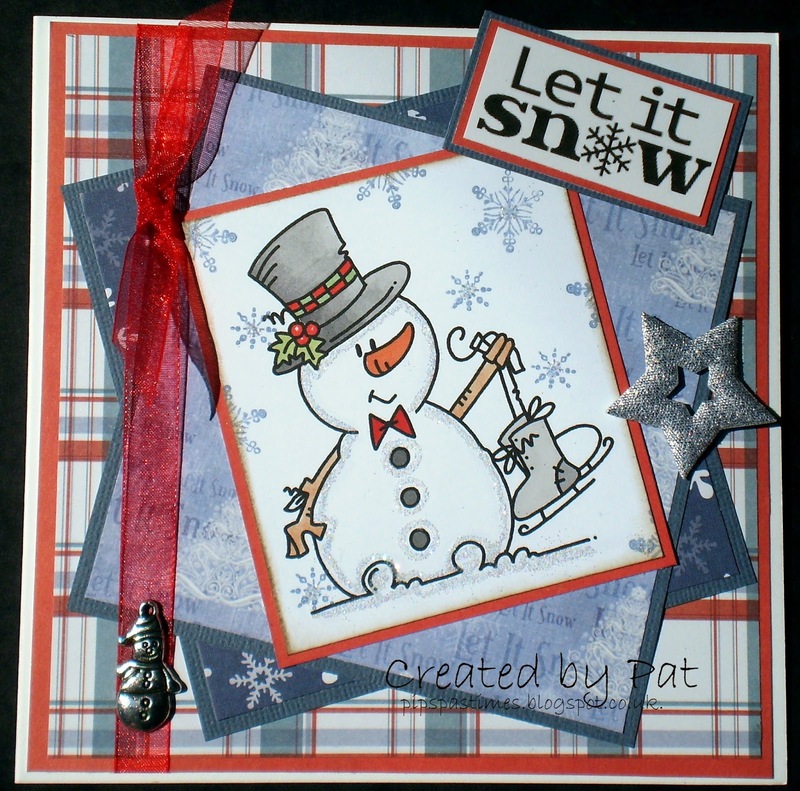 Gorgeous card Pat, love the cute snowman and fab papers. This card is equally great for a male as for a female with your choice of DPs and embellishments! Very versatile! What a great card! Lovely charm!Thanks for playing at Completely Christmas. We hope to see you next challenge! Good luck. A lovely layout and such a cute snowman. Great card! I love the little touches of glimmer all over. Well I am ready to go skating!! I do love snowmen - they have a special place in my heart. I am a little behind but not to bad. Your Christmas card is beautiful Pat, I love the cut image and the layout. Pretty papers. I need to get my bugaboo's out to play with again after seeing your cute card!